This past November (2013), Watershed Management Group's Green Living Co-op installed a "Laundry to Landscape" system at my house. The Green Living Co-op runs on a barn raising principle - basically you earn "hours" by participating in other members' projects. After you've earned a set amount of hours, you qualify to host a workshop at your house. A co-op project manager works with you to design the system and oversees the project work. They also provide educational information along the way. 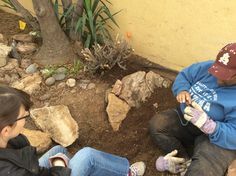 The end result is that the homeowner gets a well-designed project installed with free labor and the participants get hands-on practice building out these projects. Having an experienced designer lead you through the steps to build out one of these projects really builds confidence that you can do this! Here's a short video showing the progression through pre-planning, the day of the installation, and the subsequent test run of my new "Laundry to Landscape" system. I love it! It provides water for tree canopy coverage on this western exposure – the hottest side of my house. It provides water for vines growing up a trellis in front of my patio and my big, west-facing windows. These vines will act as solar baffles for the low western setting sun that sneaks in under the tree canopy in the evening and which currently heats up the mass of my brick house and transfers that heat inside. When you’re dealing with 100 days of 100° + temps (30 of those days between 110° - 120°), the very last thing you want is the setting sun taking one final opportunity to add more heat to your living space! With only 7.5” of annual rainfall in Phoenix, we need to use water wisely. 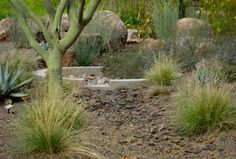 Reusing greywater is a great way to grow desert-adapted trees, shrubs, vines and more – essentially slowing down and capturing more “energy” from this element instead of letting it flow into the municipal sewer system. 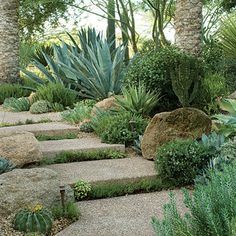 These native and xeric plants function to attract native pollinators, cover the ground to hold moisture, provide shade, provide food and act as a living air conditioner making the whole property cooler and more pleasant to be in. It is regularly 10-20° F cooler on my property when compared with properties that have predominantly grass or rock landscaping. 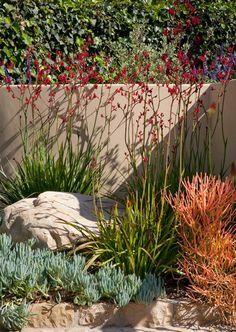 The reclaimed water and the woody mulch in the infiltration basins, help build more fertile, biologically-active soils that will, over time, alter the texture of our highly compacted clay soil, allowing an ever greater range of plants to fill in various niches. There is also a very important community aspect to this project. Because I live in the urban core of the largest dryland city in the USA (and the 6th largest metro area overall), showcasing working projects that are viewable to passersby is a big goal of mine. People like to see how something works – what it looks like, feels like. A well maintained project with an informational sign or two, an invitation to tour the site and maybe a related “Introduction to Permaculture” class, will greatly increase the acceptance and implementation of similar projects throughout the neighborhood and beyond. So basically, we desert dwellers need to get over the prevailing “squick factor” Western culture tends to have around greywater and embrace this valuable resource as one of the major forces in re-greening our deserts. Posted in Community, Greywater, Water Harvesting. Tags: community, Green Living Co-op, greywater, laundry to landscape, water harvesting, Watershed Management Group on December 13, 2013 by Jennifer. Living in a dryland, one of my goals is to capture and reuse as much of my “greywater” as I can, here on my property, "Dolce Verde" in the middle of Phoenix's downtown Historic District. Permaculture handydude, Chip S., takes the inaugural shower after hooking up the hot and cold water. 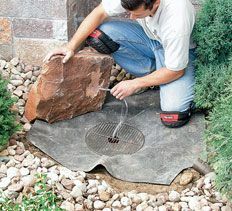 A jandy valve that allows you to switch kitchen sink water from landscape to sewer and back again. Very convenient! Note that kitchen sink water is considered “dark grey water”. This is because kitchen sink water often includes things like grease from washing dishes or harsh chemicals such as cleaning supplies, or other things people put down sinks like solvents (paint thinner, etc). While kitchen sink water can be used as a resource, you have to manage it more closely than other sources of greywater. And you definitely need a jandy valve – a valve that will allow you to switch from venting the water from your landscape to your sewer and back again, to control the water quality that goes to your landscape. Toilet water is considered “black water” due to public health concerns with human waste products. The best way to handle toilet water is to get (or make) a composting toilet. There are sleek models for inside the house or versions for outdoor models you can build yourself. One of the common problems of greywater is access – how do you get it from inside the house to the landscape? In my case, my bathroom shower/tub was located on an outside wall, but on the other side was a screened in back porch with a cement slab floor. It would have cost a lot for me to retrofit the indoor shower to vent to the outside. So I decided to turn this problem into a solution and create a fabulous outdoor shower. It’s piped for both hot and cold water and the weather in Phoenix makes showering outside possible all year ‘round. I think I’ve used my indoor shower less than a dozen times since this project was completed in May of 2008. 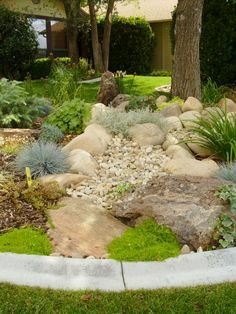 With greywater, you want to immediately direct the water into an area where it can soak in – you want to avoid storing greywater or directing it to a place that has poor drainage. Always do a “percolation test” (or “perc test”) on your soil by digging a hole about a foot deep, filling it full of water, letting it drain, filling it again and then seeing how long it takes that water to completely drain from that area. If it drains in under 4 hours – you are good to go. If longer, your soil needs work. Consider a different spot. 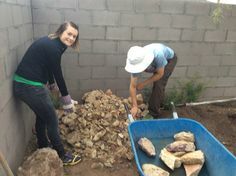 Using the perc test, we determined that even though I have fairly heavy clay soil, the “perc rate” was adequate for the amount of greywater that would be generated for 2 people taking daily showers of about 5-10 minutes. We designed the shower to have three drains. 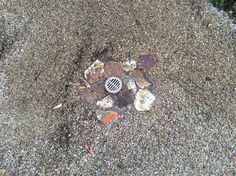 Each drain feeds an infiltration pit. The idea is that you block off two of the drains with rubber drain covers each time you shower, leaving the third open. The next person to take a shower, moves the drain covers according to a predetermined plan. It’s easy to water some plants more with this system, if say, you have a higher water use plant that will need extra water. Frame out of the base of the shower stall with three drains, each leading to an infiltration pit. Note the shower is slightly raised allowing for gravity feed from the shower base into the infiltration pits (1/4” drop per linear foot). These two infiltration pits will grow grapevines up and over the yet-to-be-built shade house across the back (east side) of my house. In the hot desert summer, the vines will block the morning sun from hitting the bricks of my house and heating it up during the summer. In winter, the vines lose their leaves and the sun hits the bricks, helping to passively warm the house. This is the wall that needs protection from the early morning desert sun – you can see I have outdoor blinds protecting my windows. These pictures were taken in mid-May and we’re already well into the 100°+ days. The finished shower platform with three drains. The beginnings of the shade house structure that will ultimately hold the outdoor shower, henyard with compost piles and propagation area. The interior of the shower. The walls are white fiberglass that will withstand our intense summer heat and sun. There’s also a light in the shower for nighttime use. The shower functions as an outdoor lighting feature at night – with the light on it looks like a large Japanese shoji lantern – an unexpected and delightful effect. The shade house starting to take shape around the shower. The slated parts are the back of the compost bins (slats are removable). The hens’ roosting areas are located over the compost bins. 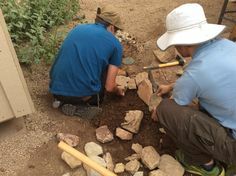 This greywater portion of this project was led by Brad Lancaster, author of the bestselling “Rainwater Harvesting for Drylands and Beyond, Vol. 1 and 2”. These books are invaluable to any water harvesting endeavor. You can find them in my shop. Posted in Greywater, Water Harvesting. Tags: greywater, water harvesting on November 2, 2013 by Jennifer.